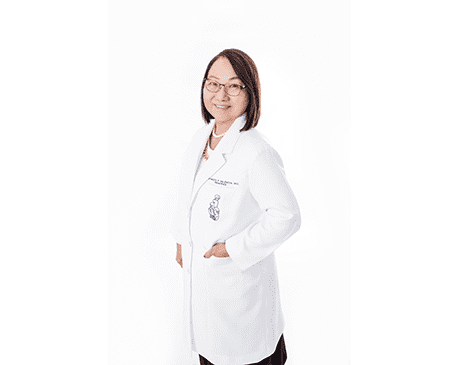 Rainilda Valencia, MD, is a board-certified pediatrician with almost 40 years of experience treating children in the United States, Saudi Arabia, and the Philippines. She specializes in asthma and allergies and provides a wide range of medical services for her patients at Valencia Pediatrics in the High Desert area of Hesperia, Apple Valley, and Victorville, California. Dr. Valencia is fluent in English, Spanish, Arabic, and Tagalog. Dr. Valencia earned her bachelor’s and medical degrees from the University of Santo Tomas in Manila, Philippines, and completed an internship and residency at the Medical City Hospital in Manila, where she was named Most Outstanding Intern and served as Chief Resident of the pediatrics department. After relocating to the US, she completed a second internship at St. Joseph’s Hospital and Medical Center in Phoenix and a second residency at Loma Linda University Children’s Hospital in Loma Linda, California, where she was honored with the Pediatric Emergency Medicine Award. Dr. Valencia’s natural aptitude for medicine and dedication to her work has led her to always perform at the top of her field. She’s been recognized for her work with a number of awards, such as The Crossroads Rotary Club & The Unforgettables Foundation award for Best Pediatrician, the Inland Empire Health Plan’s Special Physician Recognition, the Knights of Columbus award for Physician of the Year, and the Filipino American Association of the High Desert’s Outstanding Citizen Achievement Award. She’s also a fellow of the American Academy of Pediatrics, has been named a Victor Valley Health Care Leader by the California State Legislature, was voted as the Best Physician-Specialist of the Desert by readers of the Victorville Daily Press, and was honored with a Special Physician Recognition by Sanofi Pasteur for dedication to preventing infectious diseases and protecting human life through immunization. In her professional career, Dr. Valencia has held a number of leadership positions at Victor Valley Global Medical Center in Victorville, such as Chairman and Vice Chairman of the Department of Pediatrics and Vice Chairman of the Maternity and Child Health Department. She was also a member of the Physician Advisory Committee at St. Mary Medical Center in Apple Valley, California. Outside of her practice, Dr. Valencia volunteers her time to local events such as kids fairs and career days for various elementary schools. She’s also involved in medical missions that help third world countries in Asia. She lives in the High Desert with her husband and children and loves to cook, travel, and spend time with her family. Valencia Pediatrics accepts most major insurance plans. Here is just a short list of insurances we accept. If you do not see your insurance provider listed, please contact our office.